and stomp righteousness into the mud. God, God-revealed, does all this. And he can destroy it as easily as make it. He can turn this vast wonder into total waste.People hate this kind of talk. Raw truth is never popular. the luxury homes you have built. from the expensive vineyards you’ve planted. the enormity of your sins. Appalling! taking bribes right and left and kicking the poor when they’re down. Justice is a lost cause. Evil is epidemic. Decent people throw up their hands. and maybe it will happen. “Go out into the streets and lament loudly! Fill the malls and shops with cries of doom! Empty offices, stores, factories, workplaces. Enlist everyone in the general lament. right into the jaws of a bear. and is raped by a neighbor. a black cloud with no silver lining. I want justiceâ€”oceans of it. I want fairnessâ€”rivers of it. That’s pretty much it from me for year. I’m off to Germany to be with my wife, who incidentally got her marriage visa from the embassy (another big joke I will share with you later). This is what I have been trying to tell people all along. You win some, you lose some. 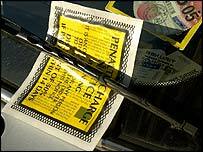 Back in October I blogged about how time constraints forced me to give up and pay the Â£45 bribe parking fine the police were demanding. I paid as the date they were asking me to appear in court I was due to be on a beach somewhere in Maui. This is a Constitutional Act, that means it cannot be overruled by a later by an ‘ordinary’ Act such as the Road Traffic Act 1991. Below is an edited version of the letter I wrote to Coventry City Council. The photos I included showed different angles of the road where the lines were almost entirely worn out. This is not a template letter, however, I hope you may find it useful in constructing your own defence. If you are going to defend against a parking ticket you may want to check out Pepipoo forums. I am writing to appeal against the Penalty Charge Notices (PCNs), on the grounds that the offence did not occur. The enclosed images are taken of the road where I was parked on these occasions, on the corner of XXXXXX Road, outside of the residents bay, outside the [Landmark] and [Landmark]. Specifically, the restriction is not signed as prescribed by the Traffic Signs Regulations and General Directions 2002 (the TSRGDs). References in this representation to Road Markings refer to that statutory instrument (2002/3113). 1) The signing/road marking is non-prescribed, as road markings must conform to the enclosed diagram (Schedule 6 Road Markings). The road markings numbered 1017/1018.1 are continuous lines terminating with T-Bars. Particular attention is drawn to item 4, Permitted Variants: None. The road markings in the restricted area are not continuous, or visible and do not have the required T-Bar endings, therefore varying from the prescribed regulation. From the photographs, there are no single or double yellow lines apart from some double yellow lines leading from the edge of the entrance to the [Landmark] to the corner before the drain. A closer inspection reveals that there are indeed some light faded patches of yellow on the road where I was parked, directly outside of [Landmark]. Since the road markings are not in conformity with the regulations then there can have been no contravention. This is clear form the court decisions of MacLeod v Hamilton (1965) S.L.T 305 and the PATAS Adjudicator decision in Cooper v Richmond (as reported on 18/07/00). If signs to indicate the effect of a “No Waiting” order have not been erected, or signs have been erected not conforming to s.64 of the RTRA 1984 and TSRGD 2002 (SI 2002/3113), no offence against the “No Waiting” order is committed. Because by s.64 (2) of the Road Traffic Regulation Act 1984 traffic signs shall be of the size, colour and type prescribed by regulation, if a sign the contravention of which is an offence contrary to s.36 is not as prescribed by the regulation, no offence is committed if the sign is contravened, even if the sign is clearly recognisable to a reasonable man as a sign of that kind. 2) Both of the PCNs issued fail to comply with Section 66(3) of the Road Traffic Act 1991 by not including a date of issue. This renders them void and unenforceable. See MacArthur v Bury (NPAS Circular 04/05) Case Number BC188 NPAS the Adjudicator decided that to comply with Section 66(3) a PCN must have a date. The date of the contravention is not the date of issue even if, in most cases, the PCN will be issued on the same day as the contravention. A real possibility of prejudice arises from potential uncertainty as to when the 28 day and 14 day periods for payment begin and end. Coventry City Councils PCNs do not have a date of issue (see enclosed). 3) Not withstanding the above, the appellant submits that Coventry City Council is attempting to extort money in an unlawful manner. “That all grants and promises of fines and forfeitures of particular persons before conviction are illegal and void”. I am not aware that the Road Traffic Act 1991 makes express reference to repealing the Bill of Rights Act 1689. Therefore, it would appear that Coventry City Council have no lawful authority to demand money for any alleged offence until or unless it has been dealt with by a Court of Law. Consequently, the forfeit that you have demanded of me is illegal and void. As I am sure you will understand, I cannot knowingly involve myself in an illegal act and accordingly decline payment of this fine. 3. Extract of Metric Martyrs Judgment, Sections 62 and 63. 4. Photographs taken at time of alleged offence. I must warn you I am no lawyer and by taking any advice on this blog you are solely responsible for any consequences of actions based upon this information. That said, I wish you every success in sticking it to ’em. [False Choice] Justice or Mercy? Mercy is not the opposite of justice, in fact, it can be argued that mercy compels us to fight for justice. There is a false truth being propagated in the Church today, you may have heard it already. I don’t know the exact source this has come from but it goes that people tend to fall into one of 2 categories: Justice (Judgment) or Mercy. Whichever side of the line you fall will influence your decisions and interactions with people.